This a custom component for Home Assistant. It combines real-time weather readings from a Smart Weather weather station produced by WeatherFlow and Forecast data from Dark Sky. It can create several sensor entities for each weather reading like Temperature, Precipitation, Rain etc. and it can create two binary_sensor, one indicating if it freezes outside and one indicating if it is raining. 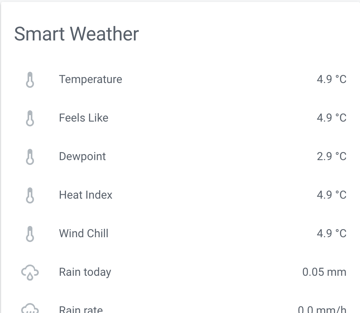 Finally it can also create a weather component, that then combines the real-time readings from the Weather Station and the Forecast data from Dark Sky, in to a standard weathercomponent. 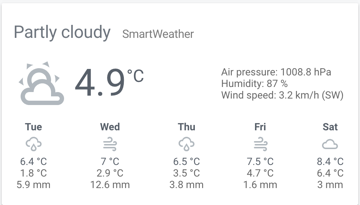 The smartweather component uses the WeatherFlow REST API to retrieve current data for a local WeatherStation, and it uses Dark Sky to retrieve Forecast data if the weather component is activated. If you don’t already have a custom_components directory in your config directory, create it, and then create a directory called smartweatherunder that. Copy all the files from this repository in to the smartweather folder. Remember to maintain the directory structure. Start by configuring the core platform. No matter which of the entities you activate, this has to be configured. The core platform by itself does nothing else than fetch the current data from WeatherFlow, so by activating this you will not see any entities being created in Home Assistant. (string)(Required) The WeatherFlow REST API requires a API Key, but for personal use, you can use a development key, which you can find here. Please note the restrictions applied. (string)(Optional) Additional name for the platform. (string)(Optional) Additional name for the sensors. (list)(optional) Sensors to display in the frontend. 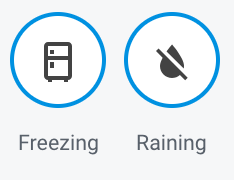 freezing - A sensor indicating if it is currently freezing outside. precipitation_last_24hr - Precipitation in the last 24 hours. The Weather Entity uses Dark Sky for forecast data. So in order to use this Entity you must obtain a API Key from Dark Sky. The API key is free but requires registration. You can make up to 1000 calls per day for free which means that you could make one approximately every 86 seconds. Also, (once I have it working!) is there any chance you could add brightness as a monitored condition? Station ID 1234 is a non existing station, so that might be the cause of your error (and I need to make more checks for that). Could you please try with station id 2777, which is my station, and I know this is available. Also please show me your configuration, and the environment you are running HA in. I have only tested this on a Docker setup. And yes, adding brightness can be done for sure. This is exactly something I was wanting. I’ve got a Weatherflow PWS which I wanted to use the obs for, but obviously it can’t forecast. This is perfect - i’ll be trying this out soon and will provide feedback! illuminance (Brightness) has now been added to the component. Reduced decimals to 1 for Precipitation values when using Metric Unitsystem. I am in a Metric region, so for you guys using Imperial Units, please let me know if values are displayed correct. I know this card, but that alone will not do what I want, as you will still need the data from somewhere. And that is the real purpose of this component - pulling data from my local WeatherFlow station. As an add-on I then created the weather entity, (More to see if I could do it ) but when using the card you refer to, you are right, you would only need the sensor entity of this component to get the local data. If people only want to use the built-in Weather Card, the weather entity of this component will let them get their local current data combined with the DarkSky forecast in a simple way. Using 2777 gives the same error. Just one thing to change in your installation instructions, change custom_component to custom_components - I’ve got a new install and that tripped me up. Invalid config for [smartweather]: required key not provided @ data['platform']. @klogg: The new error you are getting is most likely due to a caching error. Try deleting the __pycache__ directory on both the smartweather directory and the smartweatherio directory, and then restart again. @efleming: Thanks for the tip on the installation instructions - I’ll fix that. Have you supplied the station_id: and the api_key:? It seems to complain about a missing key. If the missing keys is not the issue, I am a bit in the dark why this will not start up. I cannot replicate the problem. I would be surprised as I am only importing requests, sys, and datetime from standard Python. But if anyone with better Python skills than me, could help figure out why this does not wotk on Hassio, I would very much appreciate it. And if anyone else has downloaded this, and got it working, I would appreciate if you would post a reply here, with the Environment you are running HA in. Could it be the public API key for Weatherflow causing an issue? I might request a personal one just in case. The new error you are getting is most likely due to a caching error. Try deleting the __pycache__ directory on both the smartweather directory and the smartweatherio directory, and then restart again. Just copied your config setting in to my system, and it loads without problems. So as stated before, it must be the difference in Docker and Hassio, that is causing the issue. As said I am working on a more debugging, and will revert as soon as this is done. It might take a day or two, as I need to do other stuff right now. I also get same error when checking the configuration on Home Assistant in venv. The component loads and the sensor gets the value. First only add the smartweather platform, no sensor, binary_sensor or weather. And let me know if you get errors. If no errors, load the entities one at a time, and let me know which entity gives the error.